Over New Year my hubby and I spent five wonderful days by the coast without TV and virtually without internet. I think it did me good, although I didn't exactly do it on purpose. I don't mean I went on holiday by mistake, I fully intended to get away from London for five days. But going cold turkey from tech was unintentional. When I got to my holiday flat by the sea I discovered the recent storms had blown the aerial down so the TV wasn't getting any signal; then I realised I hadn't topped up my internet dongle and also couldn't remember the password. So, no TV and no internet in the flat. The local pub along the waterfront had WiFi, which meant I could do a little blogging while enjoying a glass of wine and some fish and chips, but I couldn't spend all day glued to my laptop. Instead, my hubby and I went for walks along the beach and around the harbour, we played a boardgame or two and rewatched a few old DVDs (including Kiki's Delivery Service, one of my own personal favourites). And, of course, we enjoyed a meal and a glass or two in the waterfront pub. I might not have intended to take a holiday from TV and the internet, but I do feel relaxed from the break. Maybe I'll do it again some time. 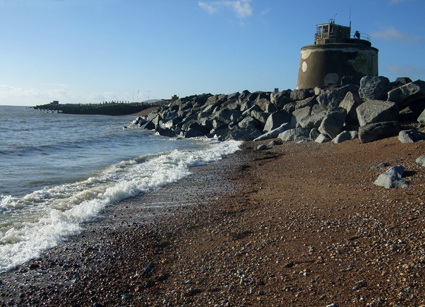 The photo at the top shows a Martello Tower on the beach near my holiday flat. Heh heh... You said dongle!